The Sackler is a busy lending library for several disciplines, and many books are borrowed and returned each day. Our dedicated shelving team and other Reader Services staff members do an invaluable job at keeping on top of the stacks of books needing to be shelved every day. 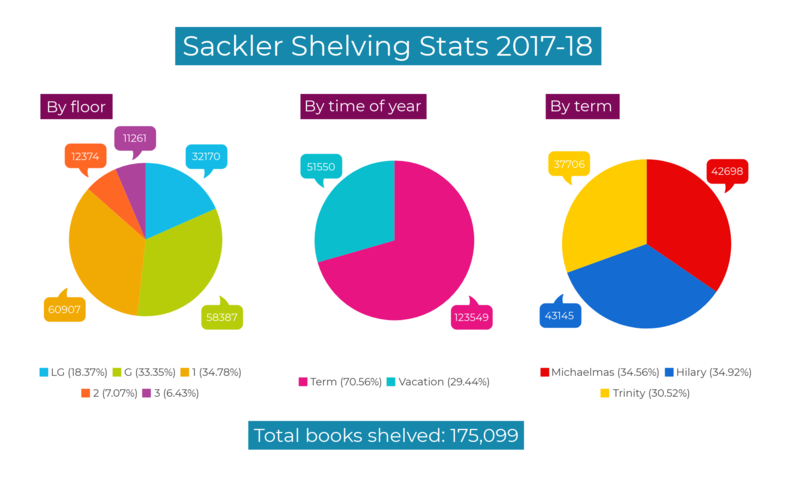 During academic year 2017-2018, Sackler staff shelved over 175,000 books — more than half of the total number of books in the whole library. This is a really impressive effort, and shows just how important shelving is to the successful operation of the library. Moreover, art/architecture/archaeology books are heavy. 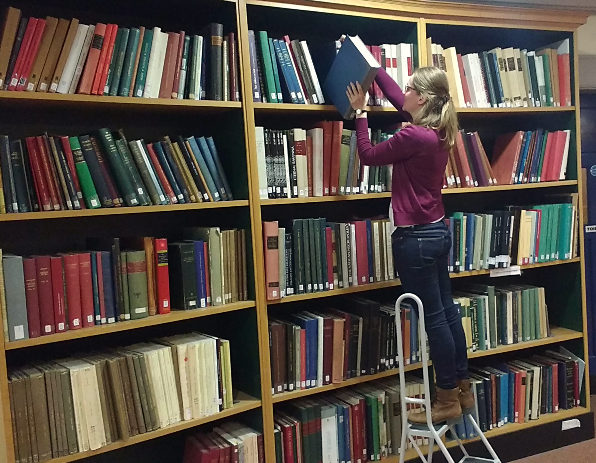 Shelving 175,000 Sackler Library books entails a great deal of strenuous lifting. Who needs a workout? The pie chart (below) breaks down those 175,000 books. Most books needing to be shelved were on the ground floor and 1st floor, followed by the lower ground floor, then the 2nd and 3rd floors. The ground and 1st floors house monographs and journals on Classics and Classical Archaeology, Ancient History, Ancient Near Eastern Studies and Egyptology. The 2nd and 3rd Floors house the Western and Eastern Art collections, supporting the research, study and teaching needs of a more wide-ranging readership, but fewer in numbers — hence the lower shelving figures. As expected, we do more shelving during term time than during the vacation, and shelving has been more or less the same each term, with a slight reduction for Trinity term, when exams are held (and fewer books are needed for essay preparation, etc.). 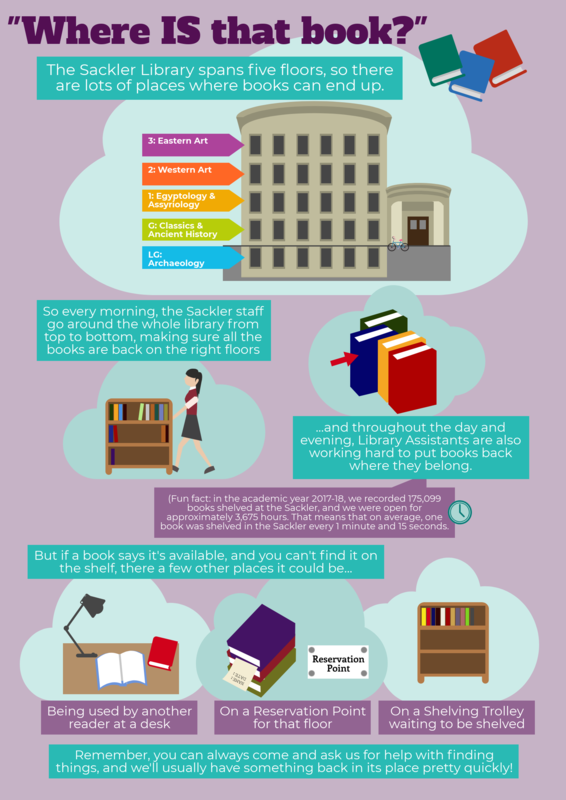 “The past academic year at Sackler saw much restructuring, part of which resulted in an improvement in the library’s shelving situation. New weekend opening hours resulted in more Library Assistants joining the Reader Services staff team, and most Library Assistants now have daily shelving responsibilities. The net effect is that there are many more hours spent shelving each week. Procedurally, shelving is now standardised across all floors as a system. Book-trolleys for shelving, labelled with shelf marks, have also been standardised and on every floor they are located on the south side of each reading room. (The exception is the ground floor, where they remain located near their respective stacks and keep exit routes clear in case of fire.) This standardisation makes it much easier for readers and staff to locate items which have been consulted in-house and are waiting to be shelved. Such changes also make it much easier to determine where exactly any given Reading Room book is located: On the correct shelf; waiting to be loaned to a borrower; held at a reservation point; forming part of the daily morning desk sweep for each floor (these books transfer immediately to the appropriate re-shelving book-trolleys for each floor); or on the book returns trolleys near the ground floor Help & Circulation Desk. As further added value, these changes bring an increased presence of Library Assistants to the Reading Rooms. While there, they can help with readers’ queries (eg, finding books!) at point of need and also help ensure that the reading rooms remain calm working environments. All the while shelving methodically on all floors throughout the day.